Muttaicose poriyal or cabbage poriyal is the sauteed and steamed cabbage leaves, seasoned with the typical Tamil way. 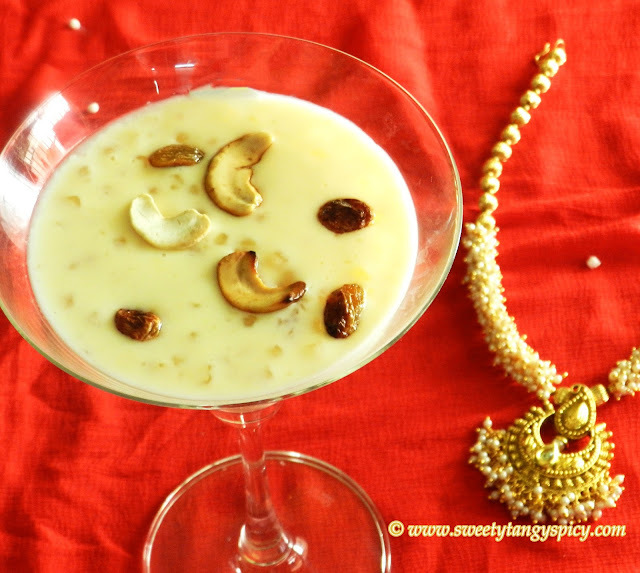 This dish is usually served with steamed rice along with some gravy like rasam, sambar etc. 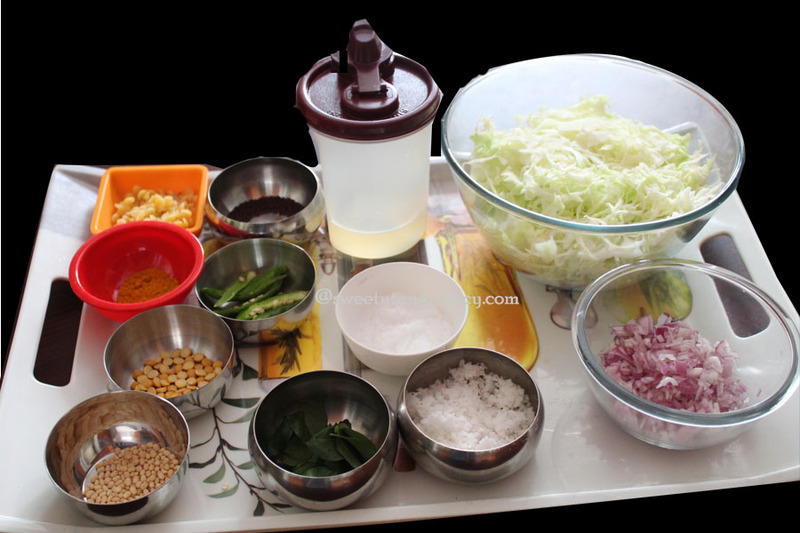 Like any other stir fries, it is one of the most common stir fry served in each and every Tamil house. But the interesting thing is that in south India we can see the different versions of cabbage stir fry. 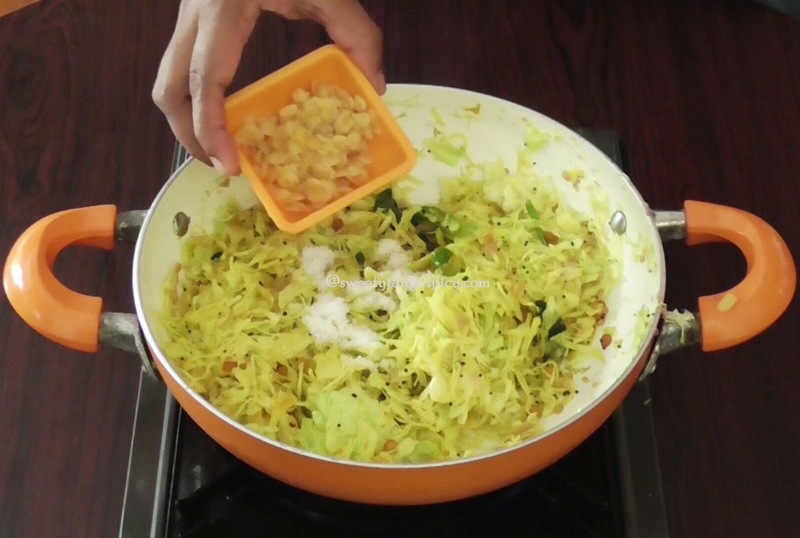 Kerala's cabbage thoran, Karnataka's kosu palya and cabbage vepudu of Andra are some famous versions of cabbage stir fry. Yes of course, they are basically same with minor changes,it might have adopted from each other. But see, all these dishes reflects the cultural difference between these states. 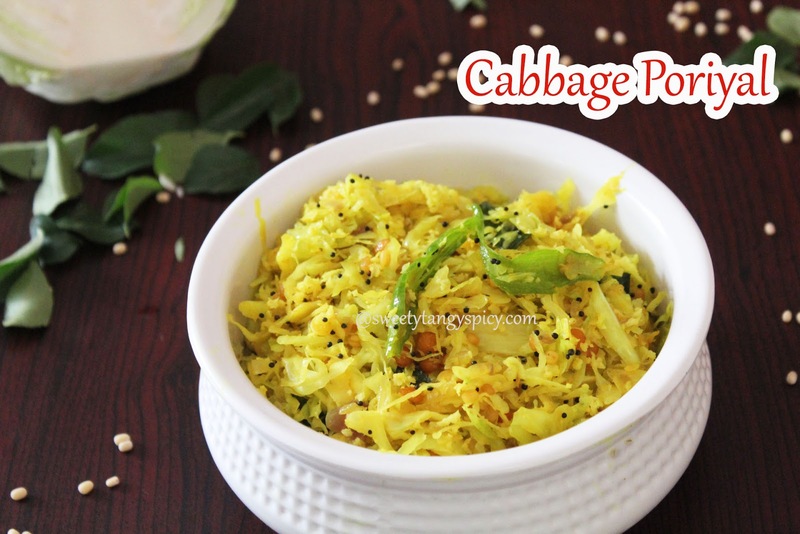 The crushed cumin-coconut spice mix along with coconut oil tempering makes the cabbage thoran delicious , but in Tamilnadu cabbage poriyal needs sunflower oil and the less amount of coconut which provides an entirely different taste and aroma. In cabbage poriyal, we don't need any crushing and grinding and the use of coconut is also minimized. I feel this is one of the great advantages of poriyal over thoran. It makes it healthier and easier, especially for those who are willing to reduce the amount of coconut. 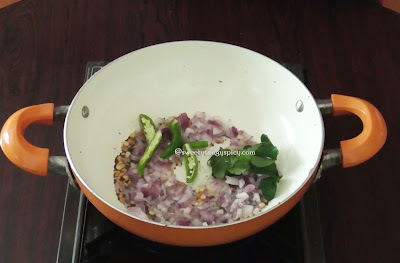 I have used a small amount of cooked pigeon peas in this dish. 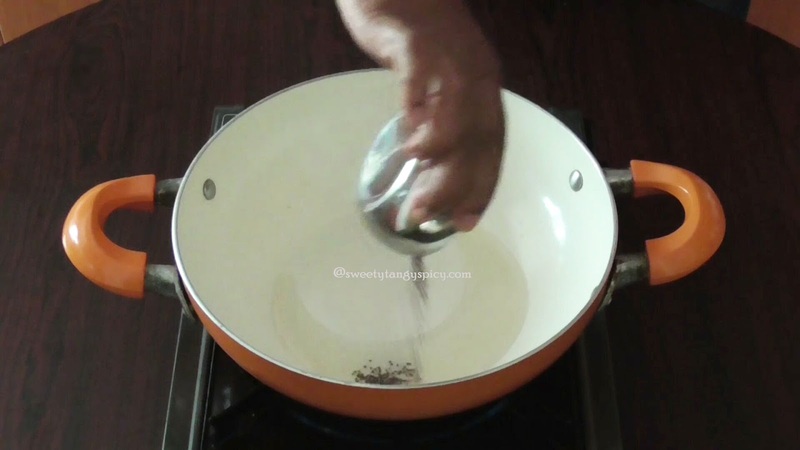 It will be better to save two teaspoons of it while preparing dal or sambar. I reserved it while making sambar in the morning. This will provide a richness to the dish. Do remember to strain water completely before mixing with the cabbage and also do not mash pigeon peas and leave a slight bit in it. Relatively small amount of coconut is used in this dish, and I am not recommending to cook after the addition of coconut. 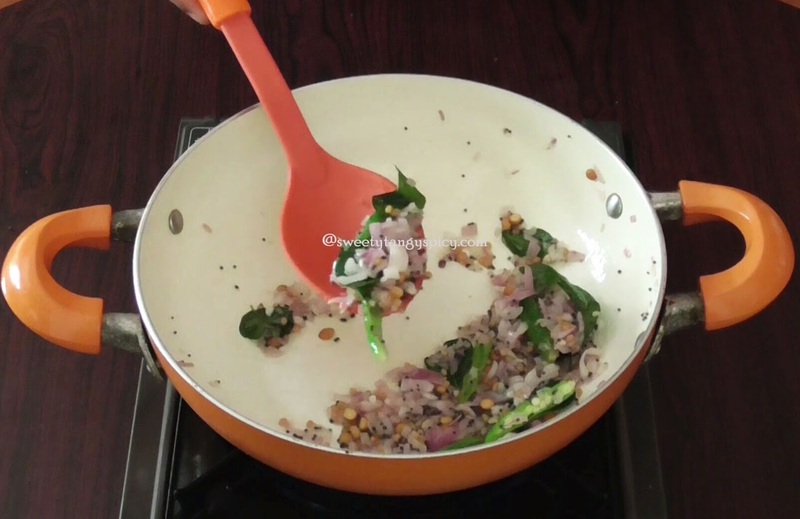 Switch off the stove immediately after adding and mixing the coconut. Actually, it alters the taste. Finally, do not pour too much water while cooking cabbages. It will spoil the taste of cabbages by making soggy. 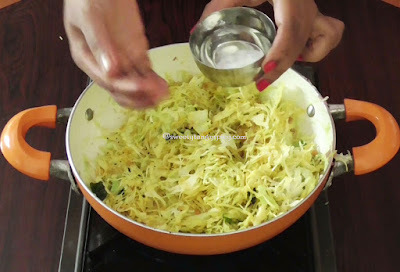 You need to sprinkle just a few drops of water in order to keep the cabbages moist throughout cooking. Wash and remove the outer two to three matured hard leaves with your hand and then chop thinly and uniformly. You can use a food processor or grater or you can follow the traditional way with a knife and chopping board. Take a medium onion, remove the skin and then slice into small pieces. Remove the stalk of green chilies and slit lengthwise. Grate a coconut using a coconut scraper and keep aside. 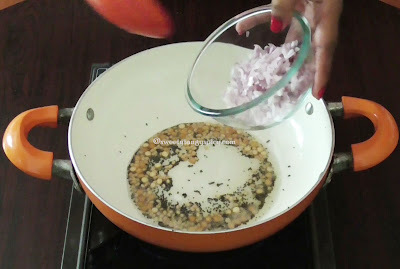 Pressure cook 1 teaspoon pigeon peas until soft. 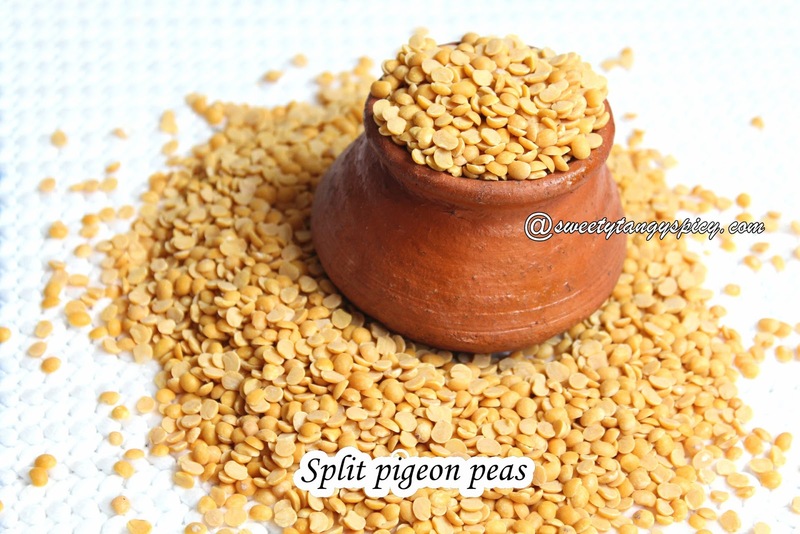 I took two tablespoons of cooked pigeon peas while preparing sambar. Heat up a pan and add enough oil. For this particular recipe, I prefer to use sunflower oil. If you don't like its taste, you can choose any other oil of your choice. 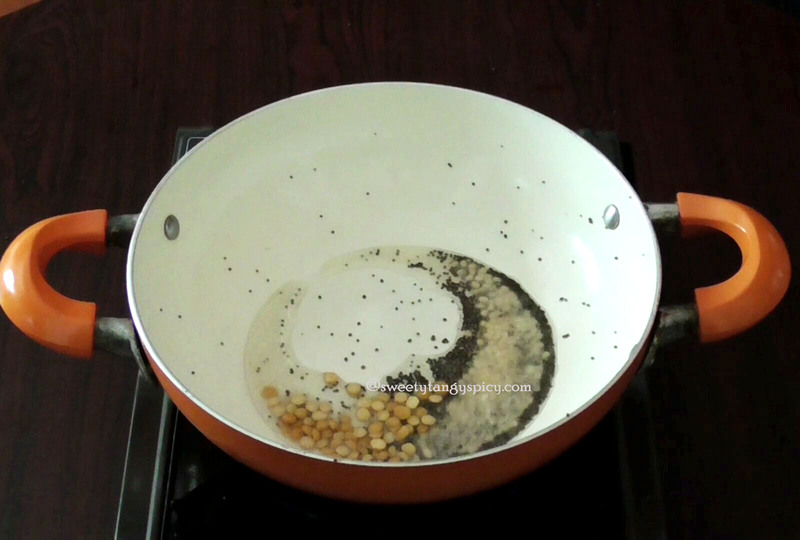 Once the oil turns hot, add 1/2 teaspoon mustard seeds. The mustard seeds will crackle instantly if your oil is hot enough. Now reduce the flame to medium or low and put the pulses, skimmed black gram (ഉഴുന്ന് പരിപ്പ്/ urad dal ) and split bengal gram (കടല പരിപ്പ് / chana dal). Saute continuously till turn light brown and crisp. Always keep an eye on it, it burns very fast. Once the pulses became brown and crisp, add sliced onion immediately and mix it. This will prevent further burning of the pulses. Put green chilies and curry leaves. Adjust the amount of green chilies to your taste. We will not add any other spices in this dish. Saute till the onion turn soft and translucent. Do not brown. Once the onion became soft, add sliced cabbages and turmeric powder. Mix well, sprinkle some water and cook covered for one to two minutes. Do not pour too much water, this will make the cabbages soggy and tasteless. 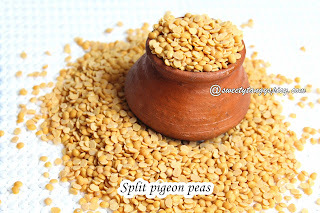 After two to three minutes, open the lid and add salt to your taste and also the cooked split pigeon peas. mix well and cook covered till the cabbages cooked completely. Once ready, add the grated coconut, mix well and immediately switch off the flame. No need to cook again. 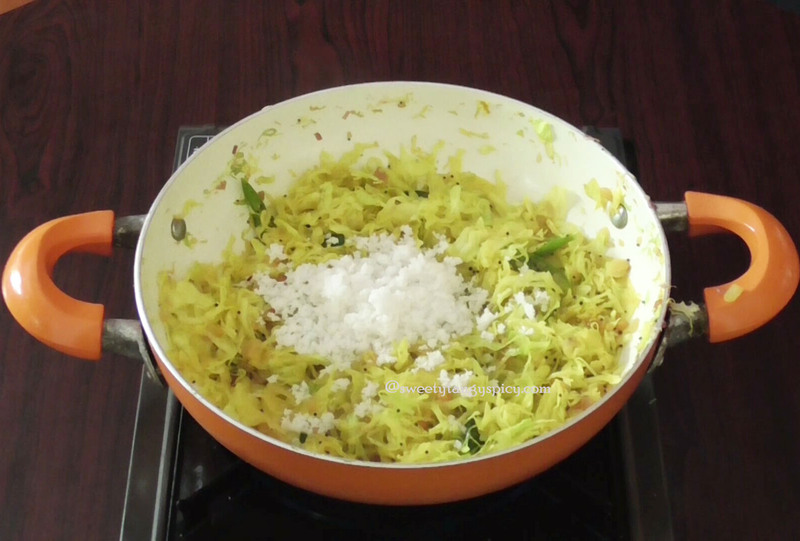 The cabbage poriyal is ready, serve with rice and some gray. 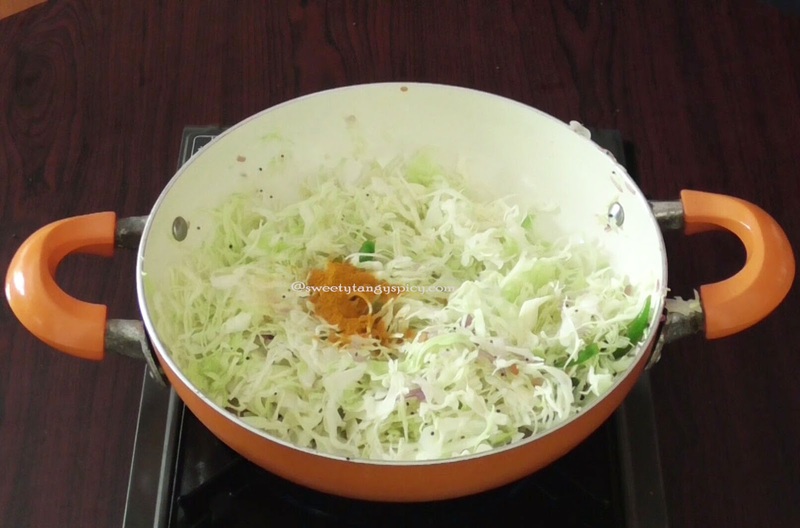 Do not put too much water while preparing cabbages, that will make the dish soggy and tasteless. Always try to keep the flame on low to medium while preparing this particular dish.